Hector Munoz is an executive director at EY, formerly Ernst & Young, a global leader in assurance, tax, transaction, and advisory services. But, he began his professional career in the Air Force. And while the business world may seem far removed from the military, Munoz says there’s more overlap than you’d think. His initial introduction to the Air Force was through the Reserve Officers’ Training Corps (ROTC), a group of officer-training programs located on college campuses nationwide. The goal of ROTC programs is to train future leaders of the US Armed Forces, and Munoz went on to be one of those leaders. He spent eight years in the service, primarily in San Antonio, Texas, and Denver, Colorado, and ended his military career as executive officer to two major generals. These days, he’s using the lessons he learned in the Air Force and applying them to his daily work at EY. 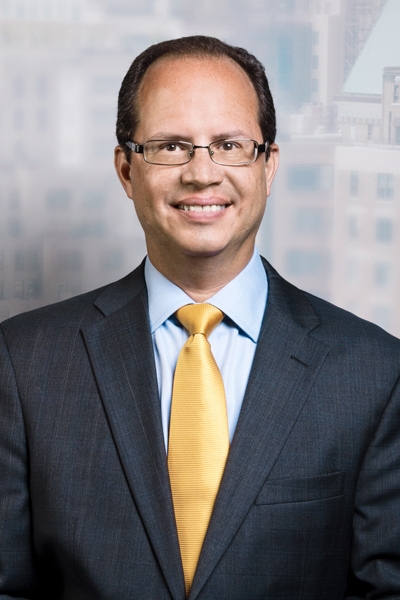 At EY, Munoz is part of the firm’s advisory-financial services practice and specifically leads the strategic transformation practice for banking, capital markets, and wealth and asset management. Every day, he helps clients develop tactics for tackling large strategic problems and address complex transformations that are challenging to implement. Munoz says that if he really had to boil it down, his definition of leadership—especially as it relates to the complexity of his EY work—is bringing everyone together to achieve something bigger than they can achieve on their own. Admittedly, his time in the Air Force informs his definition and approach. While in the Air Force, he’d get just a moment’s notice to deploy a team during the Desert Storm conflict, for example. Munoz would have to make sure the team had ground transportation, flights, permission to transport weapons, and medical-team supplies while handling myriad other details, both large and small. His team had to handle it all and achieve the impossible. If that’s not excellent training for the business world, what is? When helping companies make these challenging transitions, Munoz says the early stages are often very chaotic and difficult because the way a bank or insurance company works is being completely overhauled. But, at the end of the day, when his team has succeeded at helping a company meet its strategic objectives, Munoz says it’s incredibly fulfilling. This is also how Munoz describes the work he’s done with EY’s Advancing Latino Executives program. EY has a number of affinity groups spanning a wide range of communities, and among them is its Latino Professional Network, which Munoz describes as a ground-up group intended to foster a sense of community for Latino employees while also focusing on professional development. Admittedly, he says, most companies have this type of affinity group. It appears that increasing engagement is paying off. This past May, it was announced that EY had reached the number one spot on DiversityInc’s Top 50 Companies for Diversity list—the first time a professional-services firm earned the top spot on the list. Munoz cites the tone at the top of the firm as a primary reason this recognition was achieved, but he says it’s also about engagement at the top. Clearly, recruitment and advancement are very different at EY than in the Air Force. Munoz jokes that it’s not like “lining people up,” but he sees both as aspirational in decidedly different ways. In both instances, you’re motivating people and helping them to aspire for more. In the military, Munoz says, it’s about protecting freedom and reducing suffering. At EY, it’s about building a better working world—in a different way.